Road work on I-5 southbound from milepost 135.4 near Puyallup River Bridge Mid-Span to milepost 134.6 near East "L" St beginning at 8:59 pm on April 22, 2019 until about 6:00 am on April 23, 2019. Right lanes closed. Road work on I-5 southbound at milepost 123.58 near Thorne Lane SW beginning at 9:35 pm on April 22, 2019 until about 4:30 am on April 23, 2019. Thorne Lane on ramp to SB I-5 is closed. Road work on I-5 northbound from milepost 120.6 near Joint Base Lewis-Mcchord Main Gate to milepost 122.7 near Berkeley St SW beginning at 10:46 pm on April 22, 2019 until about 4:30 am on April 23, 2019. Right lanes closed. Road work on SR 161 northbound from milepost 22.22 near 160th St E to milepost 23.23 near 144th St E beginning at 11:19 pm on April 22, 2019 until about 4:00 am on April 23, 2019. Right lane closed. Road work on I-5 southbound from milepost 123.4 near Thorne Lane SW to milepost 122.6 near Lakewood South City Limits beginning at 11:58 pm on April 22, 2019 until about 4:30 am on April 23, 2019. Left lanes closed. 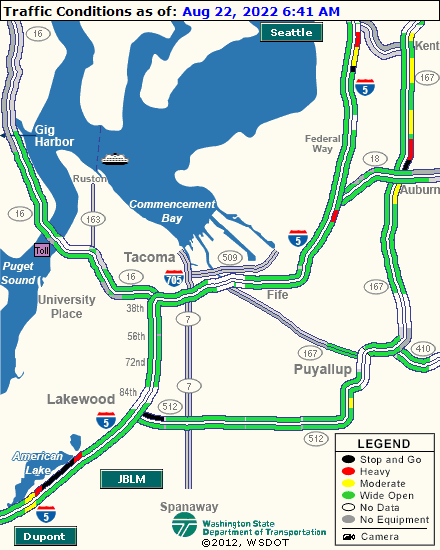 Road work on I-5 northbound from milepost 134.87 near Portland Ave E to milepost 136.19 near Port Of Tacoma Rd beginning at 12:43 am on April 23, 2019 until about 4:00 am. Left lane closed. Road work on SR 161 northbound at milepost 23.98 near 132nd St E beginning at 12:46 am on April 23, 2019 until about 4:00 am. Right lane closed.